Builders, beware of the term “billet style.” In most cases, this terminology is a sure sign of cast aluminum imitations that offer poor quality and finish. If you’re paying $35 for a pair of valve covers or an air cleaner and they tell you that they’re billet, you’re either being lied to or they might have fallen off the back of the truck. Billet Specialties made a name for itself with reputable quality parts. Today, we take a look at their oval ribbed air cleaner, small-block valve covers and breathers. With retro coming back in style, the ribbed air cleaner has become a sought-after engine dress-up item. The ribbed style was created more than 20 years ago and has seen a few variations through the years. The Billet Specialties version is an industry leader, and features a mirror finish and stainless steel mounting hardware. 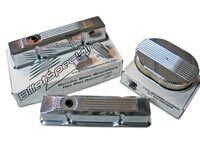 The small-block valve covers are produced from high-grade aluminum that’s polished to Billet Specialties’ standards and each design is CNC-machined in the USA. The valve covers are available in short and tall heights, and have a 1.25-inch diameter breather hole positioned between the rockers to reduce oil splash. We recommend using the tall valve covers when using roller rockers and/or stud girdles. The oval ribbed breathers are precision machined in the USA and feature a unique two-piece design with a positive O-ring seal. They’re easily maintained with a washable filter element. The PCV breather features a common replaceable PCV valve with a barbed fitting for 31/48-inch hose. Available for 111/44-inch diameter valve cover holes. A good tech tip concerning breathers and valve covers is that valve covers should be run with one breather and one PCV valve or PCV breather for proper air circulation through the engine. We tried these Billet Specialties products during an engine build-up and we noticed such a huge difference over the overseas imitations that we had to do a Product Review pronto. The parts are a lot lighter, the finish is vastly superior and the materials are of better quality. If you’re in the market for billet, what more do you need to know?